The island measures 37 square miles, of which 16 square miles is Dutch territory and 21 square miles belongs to French Saint Martin. 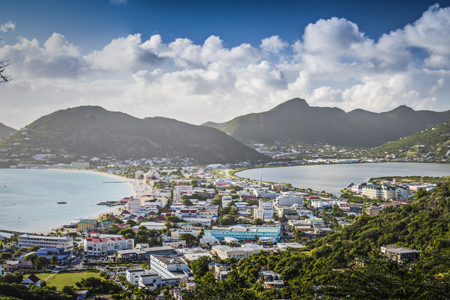 Despite its size, St Maarten/Saint Martin has varied landscapes. To the south, St Maarten is predominantly low-lying and dotted with salt pans and lagoons. Towards the center and north of the island there are hills and valleys and the terrain is more rugged. The highest point on the island is Pic Paradis with an altitude of 1,400 feet. The vegetation ranges from cacti and palm trees to hibiscus and other flowering shrubs and trees native to the Caribbean and other tropical regions of the world, and there are still some stands of forest in the hills. Phones: The country of St. Maarten is now part of the North American dialing plan; The North American Prefix is 721 followed by the 7 digit number. For example to call Simpson Bay Resort from North America you need to dial +1-721-5442503.